Getting your content discovered in search engines has been the battle digital marketers have been fighting for almost 20 years. It’s a combination of both art and science, and there are simple steps that should be on every marketers’ agenda. Danny Meadows-Klue - founder of the Digital Training Academy - has been teaching Search Engine Optimisation since the late 90s, and here he explains how consumer brands should approach content marketing and SEO. Since the late 90s it’s been clear that brands with a strong content proposition can gain significant traffic through search engine optimisation. Digital is a space hungry for quality content that really delivers to consumers’ needs and that’s why content marketing and SEO can give brands a competitive edge. First, the brand needs to get the big content idea locked down; what is the type of content they can supply that consumers are going to really appreciate? Many brands have scope to create content beyond the core product information, and reach into areas of lifestyle interest for their consumers. The challenge is to develop a content area that grows from the brands’ essence, but engages with consumers in a way that’s genuinely really informative, useful or fun. It’s a big ask, and for content marketing and SEO to be effective, marketers need to challenge themselves to really satisfy real consumer needs. Finding a content area strong enough is one of the major challenges consumer brands face in digital. Ten years ago it led the STA Travel company to create a blog for every backpacker; in sports clothing the search led Nike to create the sports lifestyle tools that would lead to fuel bands and GPS trackers; in FMCG it led Johnson & Johnson to acquire BabyCenter.com, scaling it up to become the largest parenting magazine online. These types of services and information are game changers when you get them right. For websites and other owned media channels to gain mass reach and deep use among their target consumers, that idea is the starting point. Once you have the big idea that can lead to content creation, search engine thinking needs to enter the process. Getting the audiences to the content or service is the next challenge, but the stronger the content, the easier the task. 1. Ensuring the website is SEO enabled. Removing the Flash, adding xml sitemaps, ensuring Google Webmaster Tools are in place and configured properly, building the navigation and the URLs so they can accommodate keyphrases, ensuring meta-data can be written effectively. 2. Building the content with the right phrases. Designing your articles, films or tools based on a single keyphrase consumers are searching for (we have more on this below). Persuading other websites to link to you based on the quality of your content. Is the website ready for SEO? Any well designed publishing platform and content management system (CMS) should deliver you search engine discovery. This simply means letting the search engine spiders in, and helping them find their way around your content. Looking in Google for how many pages you have indexed will instantly tell you whether you have any major barriers. The real challenge of unlocking the value – the second step – is where most brands fall short. It’s naïve to think this is enough. It would be like buying a car and expecting to drive without loading in the fuel; your content. If you’ve been on one of the Digital Acceleration training programmes, you’ll know all about Google Adwords and the similar tools from other search engines that help you see what people are searching for in your content area. From this long list, a good agency should be able to quickly identify which keyphrases are ones where you can be fit to compete or fit to win. That judgement isn’t just based on your own scope for content creation, it’s also based on how intense the competition is in the natural listings. If you run a beauty brand and are planning content in a high value business sector for skincare that sees you competing against cosmetic surgery firms, you can be sure there will be a big challenge ahead. That’s why some FMCG firms have gone as far as buying or creating rich online magazines giving them real depth of content on the areas of high interest to consumers. Deciding which phrases to go into battle on needs deep consideration in the context of where you can win rather than simply what’s being searched for. Try challenging the agency to identify those you can win on based on the competitive landscape, so you hear from them the short list of phrases where you should be able to get good volumes of traffic. They could make an educated guess on traffic volumes based on the target page position etc. Whichever phrase you pick (such as “tips for lowering cholesterol”), it then forms the base of the content for one page in the advice section of the website. The content should be easy to write, and the trick is to simply maintain keyphrase density in the important fields while writing in a way that’s engaging to consumers. Search engines are smart enough to know that the language in certain places on your page (like the headlines and sub headlines) must be more important than other areas. Once you’ve decided the keyphrase for an article, a strong copywriter will use the keyphrase in each of these fields to ensure out of everything a search engine sees, it knows there is a strong relationship between that page and one specific keyphrase. That way when a person types the phrase into a search engine, you know you’ll be considered for a high position in the natural results. Johnson & Johnson’s acquisition of BabyCenter took a simple online parenting magazine, and scaled it up into multinational content brand. They apply keyphrase thinking when commissioning all their articles, and as a result get the majority of their traffic from casual search queries through Google in 22 countries. BabyCenter has become the world's number 1 pregnancy and parenting destination site, reaching over 29 million people in 22 markets monthly. In the US their 13 million monthly reach makes them the most influential of all parenting media and in 2011 they claim that “7 in 10 babies born were BabyCenter [family] babies”. 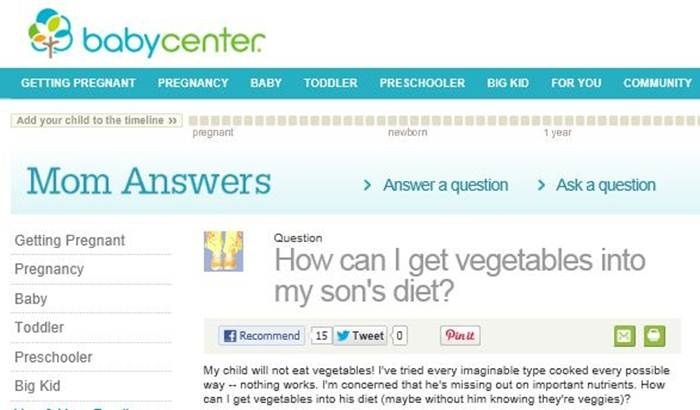 They’re also the most recommended and most trusted pregnancy and parenting website among new mums, with rich forums that become a self-sustaining engine of keyphrase optimised content. Most brands dream of being on page 1 of Google’s natural listings, yet in practice fail to make page 101. When the challenges are that tough, unless you apply the right formula, your brand will never stand a chance. Digital marketing has some rigid quality thresholds, and smart marketers know how to judge copy to ensure it is using the right approach. That’s about being fit to compete in digital for getting natural traffic. The next step is about becoming fit to win. The brilliance that gave Google a head start in the 90s was about looking not simply at the on-site factors like keyphrase density, but also applying a judgement of the importance of a website based on the collective intelligence of the rest of the internet. Simply by counting the number of inbound links, Google could distinguish between sites that lots of other websites felt were important enough to link to, and those that had almost no inbound links. By recognising in turn that some of the sites doing the linking also carried a large number of links, it could distinguish between links from highly trusted websites (Wikipedia, newspapers, journals), and fabricated link farms that no other website would bother to link to. This is at the heart of the PageRank algorithm Google’s founder wrote (based on the academic study of citation analysis) when he was a student at Stanford, and if you’d like more, there’s a simple webinar, here. This means that the best practice in digital marketing is to follow through content creation initiatives by building inbound links through a combination of classic PR approaches, social media platform integration, blogger outreach and other specialist ways of building links. One word of warning on this is that Google has strict rules on brands overtly paying to try and influence their position in the natural search listings. One of the strictest of these rules is brands buying links with the express purpose of effecting their SEO ranking. If you get caught, this can result in Google imposing a penalty for a time on your website and effectively removing your pages from the listings. It’s a high risk and one marketers should steer well clear of. To be accurate, sometimes it still does work - if done extremely carefully, and there are “shades of grey” – so if your brand is involved in these types of discussions then make sure you consult with a trusted digital media specialist (probably alongside the agency recommending this approach) to carry out an audit and assess the risk before taking it further. 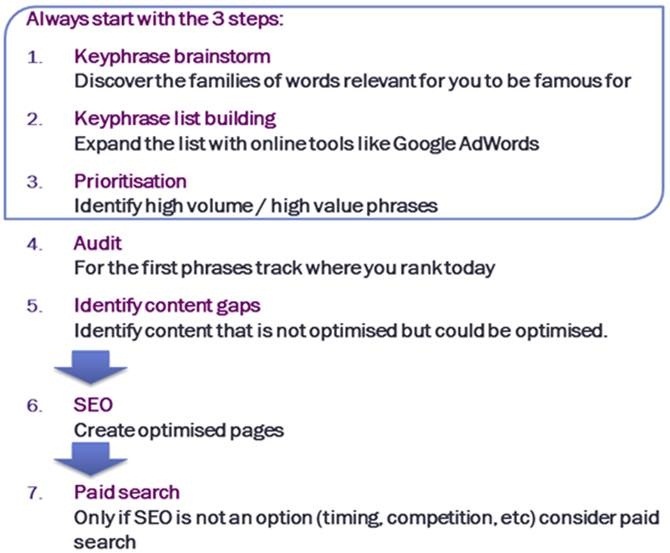 If you’re new to search engine marketing and need a simple few steps to follow, then, here’s a reminder of the Digital Action Plan steps taken from our deep dive search engine marketing training at the Digital Training Academy. The Digital Training Academy has been coaching agencies and brands on search engine optimisation strategies for content for more than a decade.